Our villa is a recent, stone-built house of 115 square metres, plus a 25 square metres courtyard. It is a ground-floor house, conceived as a spacious and comfortable place to live, with large, stone-walled rooms, furnished with much care. There are many interesting nearly places you can visit, such us: 	Faneromeni dam with spectacular view. 	Traditional village Vori, with the ethnological museum. 	The archaeological place of Festos! 	Matala with the beautiful caves where hippies used to leave and its crystal clear waters. 	Beautiful beaches with nice taverns and café: •	Kalamaki •	Kokkinos Pirgos •	Kali Limenes •	Agia Galini 	Unique View: •	Preveli Lake •	Zaros Lake 	Nithavri Village, with its breathtaking view from the mountains. 	Heraklion  Knossos (Old Palace) 	Rethymno  Picturesque old town. 	Chania  Elafonissi Island and many other unique places to visit. 	Agios Nikolaos  Spinalonga Island, opposite to Plaka. 	There is also a unique nearly island named Santorini from which you can enjoy unique sunsets! Two of the bedrooms have air condition. After an initial misunderstanding about the time of arrival we had a very pleasant stay at Villa Fabrika. Following a couple of nights in some tourist rooms at Kalamaki, the house had an air of comfort and luxury! There’s one double bed with a soft mattress another one with a firm mattress and two single beds in an alcove of the living room with rock hard mattresses. The kitchen is well equipped, but apart from boiling eggs and making toast for breakfast, we didn’t actually cook anything. The house is opposite a goat farm , so coming from the countryside, this only enhanced our stay. Others however, might be perturbed by the flies and the smell? The morning sun arrives directly in the courtyard at the front of the house, so, despite a parasol being available, we ate our breakfasts inside with the doors and windows open. 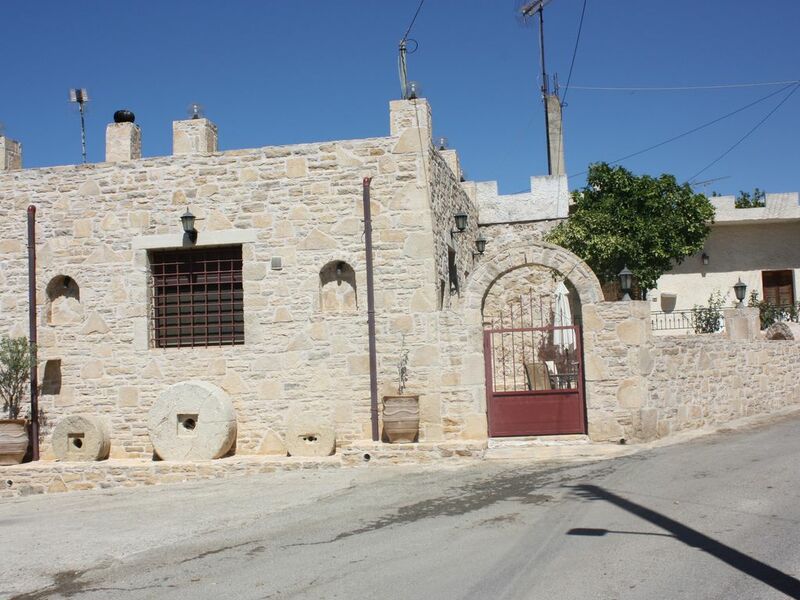 The house is in the village of Faneromeni which is just a short drive from the market towns of Tympaki and Mires. There’s a couple of restaurants and kafeneios just 2 Kms away at Vori (20-25 mins walk) and various beaches 10 to 30 minutes’ drive. In Faneromeni itself there are two small village shops, a bar that is open in the evenings and a kafeneio. The latter, run by Dimitra and Vasilis Chaniotakis, turned out to be the delight of our stay. Having failed to stock up on beer for our Sunday evening apéro, and all of the local supermarkets being shut, we strolled the 100m up the road to see what the kafeneio could offer?? They only had small cans of Amstel but “beggars can’t be choosers”. We must have shown some hunger by grabbing a couple of packets of crisps but these rapidly became redundant as Dimitra produced two small plates of nibbles to accompany our beer/ouzo. Having worked in the mines in Belgium for numerous years, Vasilis speaks a smattering of French and Dimitra several phrases in Flemish. That with our beginners Greek, we managed to discuss the possibilities of restaurants in the area and were immediately offered pork and potatoes from the oven which magically appeared on our table within a short time. Washed down with a couple of bottles of Retsina, a gift of home-grown grapes and raki to follow, this “home cooking”, at very low prices rapidly turned our stay in Fameromeni into a memorable one. We returned 6 of the following 7 nights for more local delights. The generosity of the locals is overwhelming and at times embarrassing! Thank you for you honest and kind remarks. We hope we can assist again in the future and offer you a great vacation. Very clean and well kept villa with all you could need during the stay. The owner is lovely and welcoming and it's in a great location. Very close to nice beaches and plenty of tavernas and cafes nearby. "Modern clean and fully equipped house in very quiet rural location. Hospitable owner and neighbour farmers." Nous avons passé un excellent séjour en famille dans cette maison, située dans un hameau, donc environnement très calme, mais tout près d'un joli petit village et avec tout ce qu'il fallait à proximité. La maison était bien équipée, spacieuse, avec tout ce qu'il fallait pour le séjour. Réception et dépôt de la clé facile et la personne en charge de la location fort aimable et disponible comme partout sur toute l'ile ! Et la région alentour est magnifique ce qui ne gache rien. Nous recommandons vivement cette location, très bien équipée, calme. We deeply thank you for all your kind remarks. It gives us the greatest delight every time we can fulfill your expectations and go beyond! We hope to welcome you again soon in Crete and to be able to offer you another amazing holiday! From all of us, our warmest wishes! Maison spacieuse avec un charme fou ! Bien équipée et literie excellente. Si vous recherchez un endroit calme dans un petit village crétois, c'est parfait. Un véhicule est bien sûr indispensable pour découvrir tout ce que la région offre. Bonne taverne à 2 km. We thank you truly for your kind remarks! Nothing makes us happier than your satisfaction and we would love to be able to offer you again soon an amazing stay in Crete! From Heraklion, you need to reach the road that gets out of the town, direction Agia Varavara, Mires, Timbaki, Kokkinos Pirgos. From the airport, you just take the main road passing in front of the airport towards the left (when getting out of the airport). At the traffic lights, you turn right and, after approx. 400 metres, you take the exit on your right (don't pass under the bridge!). You are now on the national road, that you will follow for approximately 6 km, until you see, on your right an exit for Mires. You take this exit, follow the curve and, at the crossroads, you turn right. Then you just follow this road for about 60 km. You will cross the small towns of Agia Varvara, then Agii Deka, then Mires. After Mires, you still go ahead for another 6 or 7 kilometres. On your left, you will see the signs for Phaistos archaeological site. You still follow the road. After the Phaistos signs, there is a curve (turning right). After this curve, you will see an exit on your right. You take this exit and follow until you enter Vori village and arrive in the central square of Vori. Here, you have to go ahead on your left, pass the cafés, then, take the road that starts from the square, on your right. After 200 m, you take on your right, following the signs "Faneromeni". You then follow this road for about one kilometre, until you enter the village of Faneromeni. You pass the petrol station, the church, and you'll soon arrive at a crossroads. You turn left. The Fabrika villa is just 50m up this road. With its old houses and small streets, Faneromeni is a typical village of south Crete. Faneromeni does not have much tourism, and remains a very traditional place. Here, you will enjoy the quietness and the beauty of south Crete. The surroundings offer many opportunities to spend an exceptional stay, whatever your interests are... The exceptional archaeological sites of Phaistos and Agia Triada, remains of the "oldest civilisation in Europe" (the Minoans), are just a couple kilometres from Faneromeni. Still in the historical field, you will find Roman sites, byzantine churches and monasteries in all the area, as well as remains of the Venetian period. Faneromeni is about 10 km from the sea, and you will find beaches of every kinds, from small rocky beaches to the long, sandy strech of Komos, Kalamaki and Timbaki (Kataliki). Some beaches are away from everything and very quiet, other ones have cafeterias where you can enjoy a drink in front of the sunset... just make up you choice! With their music bars, Matala and Agia Galini offer possibilities of night life.